CAST CHANGES! 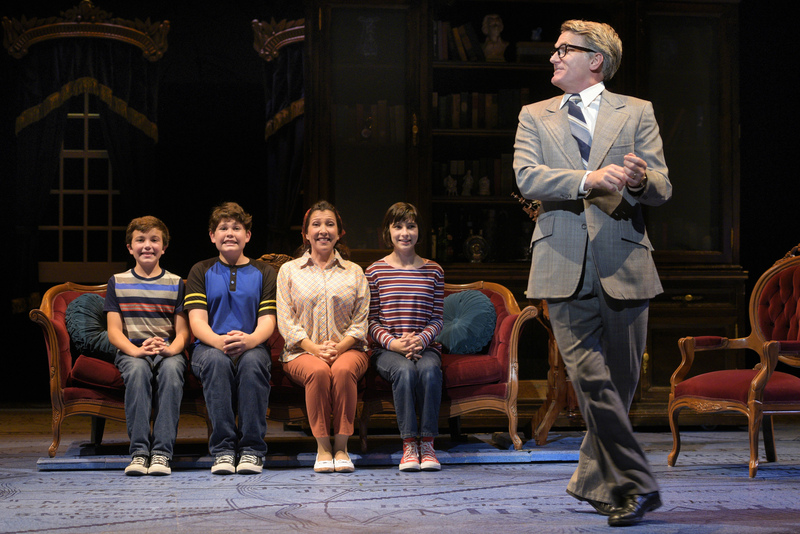 Please note there are two casts of children – to match your photo to a particular performance see caption information. 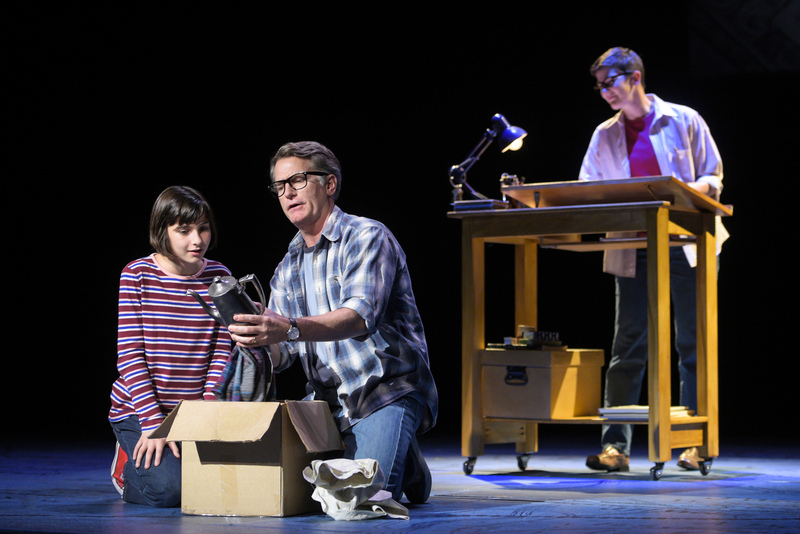 Small Alison (Lila Gold) wants to play airplane in a memory from Alison’s (Moira Stone) childhood in “Fun Home,” presented by TheatreWorks Silicon Valley October 1-28 at the Mountain View Center for the Performing Arts. NOTE: Lila appears in performances on October 3, 5, 6, 7 (7pm), 9, 11, 12, 13 (8pm), 14 (2pm), 17, 19, 20 (8pm), 21 (2pm), 24 (7:30pm), 25 (2pm), 26, 27. Small Alison (Lila Gold) and her father, Bruce (James Lloyd Reynolds), examine potential treasures from a neighbor’s barn in a memory from Alison’s (Moira Stone) childhood in “Fun Home,” presented by TheatreWorks Silicon Valley October 1-28 at the Mountain View Center for the Performing Arts. NOTE: Lila appears in performances on October 3, 5, 6, 7 (7pm), 9, 11, 12, 13 (8pm), 14 (2pm), 17, 19, 20 (8pm), 21 (2pm), 24 (7:30pm), 25 (2pm), 26, 27. 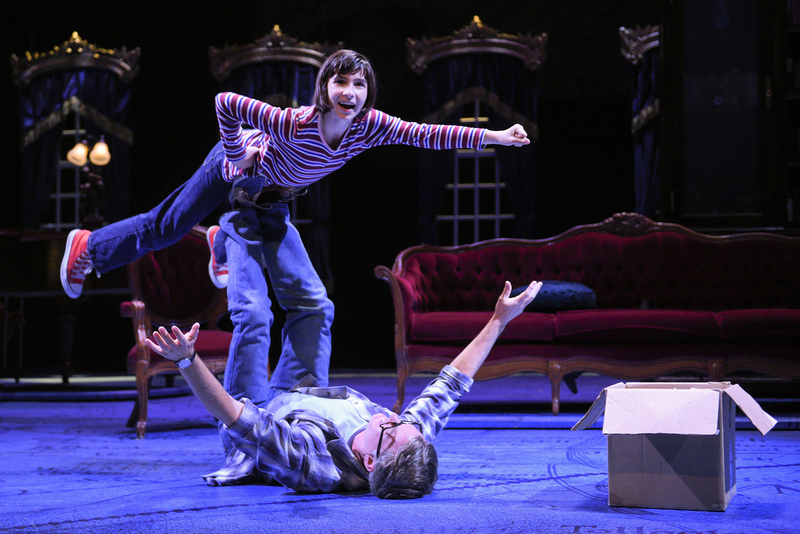 Small Alison (Lila Gold) feels like Superman as she plays airplane with her father Bruce (James Lloyd Reynolds) in “Fun Home,” presented by TheatreWorks Silicon Valley October 1-28 at the Mountain View Center for the Performing Arts. NOTE: Lila appears in performances on October 3, 5, 6, 7 (7pm), 9, 11, 12, 13 (8pm), 14 (2pm), 17, 19, 20 (8pm), 21 (2pm), 24 (7:30pm), 25 (2pm), 26, 27. 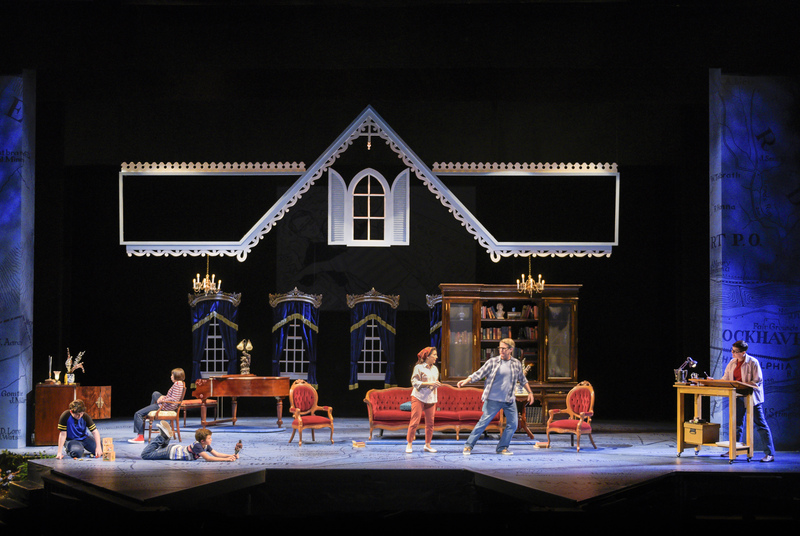 Life is busy at the Bechdel house (shown l to r: Jack Barrett, Lila Gold, Billy Hutton, Crissy Guerrero, James Lloyd Reynolds, Moira Stone) in “Fun Home,” presented by TheatreWorks Silicon Valley October 1-28 at the Mountain View Center for the Performing Arts. NOTE: These children appear in performances on October 3, 5, 6, 7 (7pm), 9, 11, 12, 13 (8pm), 14 (2pm), 17, 19, 20 (8pm), 21 (2pm), 24 (7:30pm), 25 (2pm), 26, 27. The Bechdel family (l to r: Billy Hutton, Jack Barrett, Crissy Guerrero, and Lila Gold) prepares to be perfect for father Bruce (James Lloyd Reynolds) as they welcome an important guest to their home in “Fun Home,” presented by TheatreWorks Silicon Valley October 1-28 at the Mountain View Center for the Performing Arts. NOTE: These children appear in performances on October 3, 5, 6, 7 (7pm), 9, 11, 12, 13 (8pm), 14 (2pm), 17, 19, 20 (8pm), 21 (2pm), 24 (7:30pm), 25 (2pm), 26, 27. 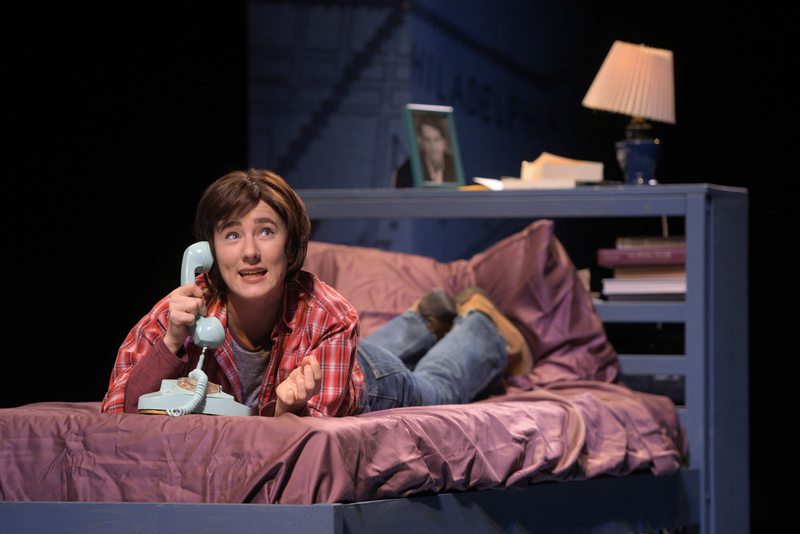 Medium Alison (Erin Kommor) calls home from college in “Fun Home,” presented by TheatreWorks Silicon Valley October 1-28 at the Mountain View Center for the Performing Arts. 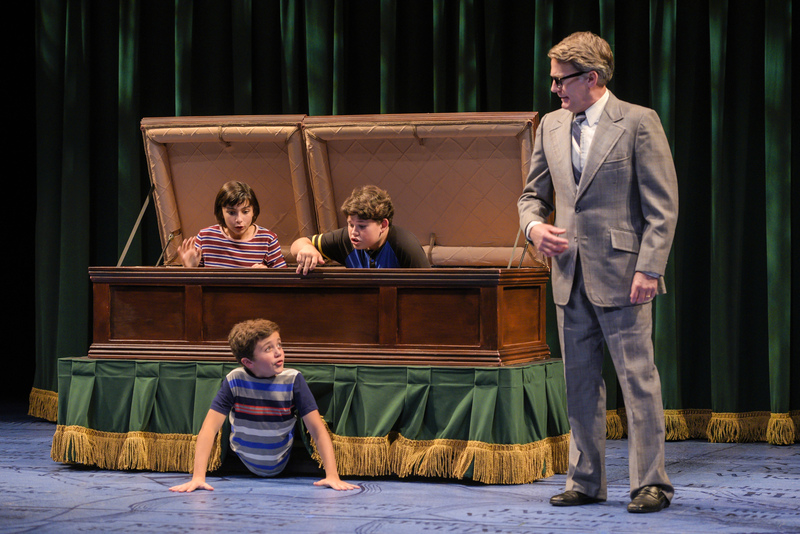 The Bechdel children (clockwise from left: Lila Gold, Jack Barrett, and Billy Hutton) play in the family-owned funeral home despite their father Bruce’s (James Lloyd Reynolds) wishes in “Fun Home,” presented by TheatreWorks Silicon Valley October 1-28 at the Mountain View Center for the Performing Arts. NOTE: These children appear in performances on October 3, 5, 6, 7 (7pm), 9, 11, 12, 13 (8pm), 14 (2pm), 17, 19, 20 (8pm), 21 (2pm), 24 (7:30pm), 25 (2pm), 26, 27. 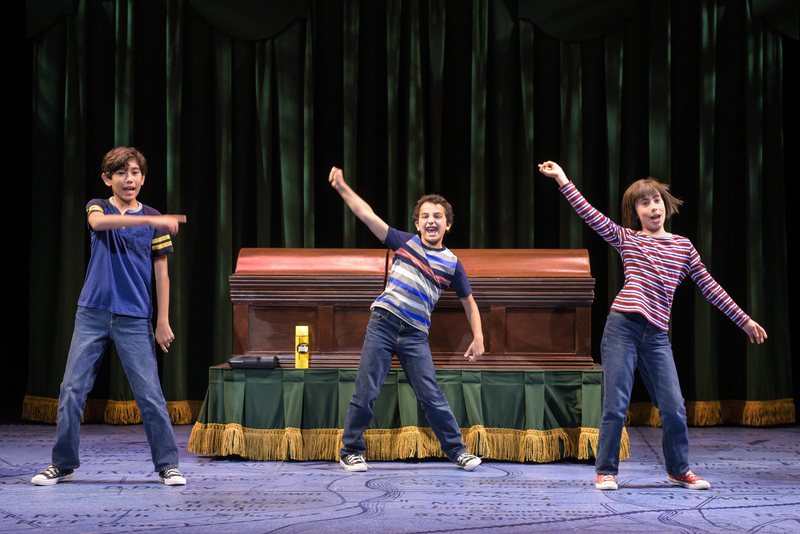 The Bechdel children (l to r: Jack Barrett, Lila Gold, and Billy Hutton) fantasize a commercial for their family-owned funeral home in “Fun Home,” presented by TheatreWorks Silicon Valley October 1-28 at the Mountain View Center for the Performing Arts. NOTE: These children appear in performances on October 3, 5, 6, 7 (7pm), 9, 11, 12, 13 (8pm), 14 (2pm), 17, 19, 20 (8pm), 21 (2pm), 24 (7:30pm), 25 (2pm), 26, 27. 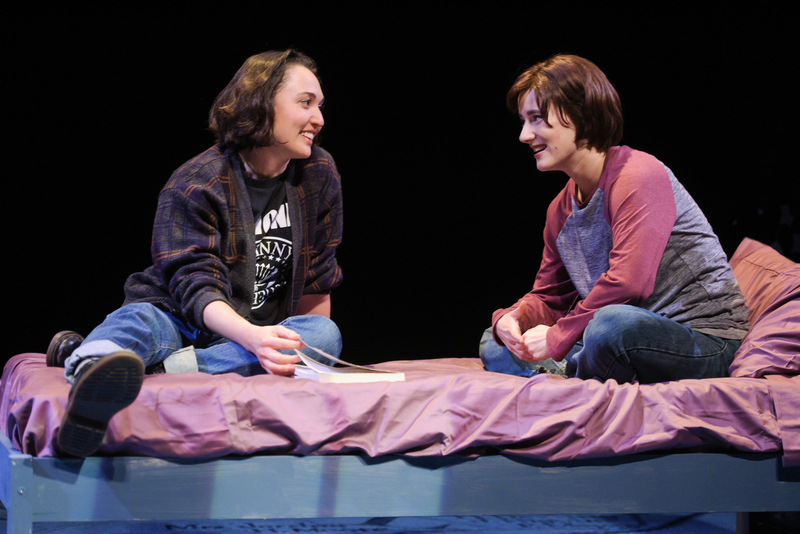 Joan (Ayelet Firstenberg) and Medium Alison (Erin Kommor) talk about Alison’s coming out in “Fun Home,” presented by TheatreWorks Silicon Valley October 1-28 at the Mountain View Center for the Performing Arts. 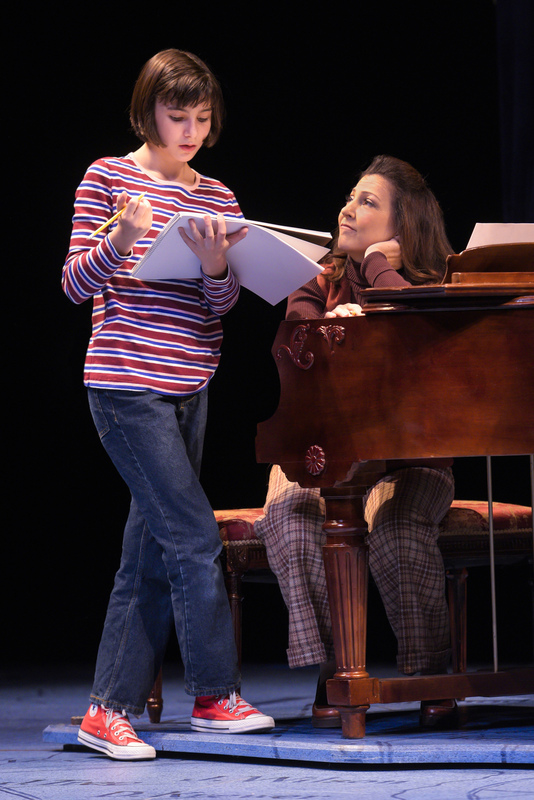 Small Alison (Lila Gold) shares a school project with her mother Helen (Crissy Guerrero) in “Fun Home,” presented by TheatreWorks Silicon Valley October 1-28 at the Mountain View Center for the Performing Arts. NOTE: Lila appears in performances on October 3, 5, 6, 7 (7pm), 9, 11, 12, 13 (8pm), 14 (2pm), 17, 19, 20 (8pm), 21 (2pm), 24 (7:30pm), 25 (2pm), 26, 27. 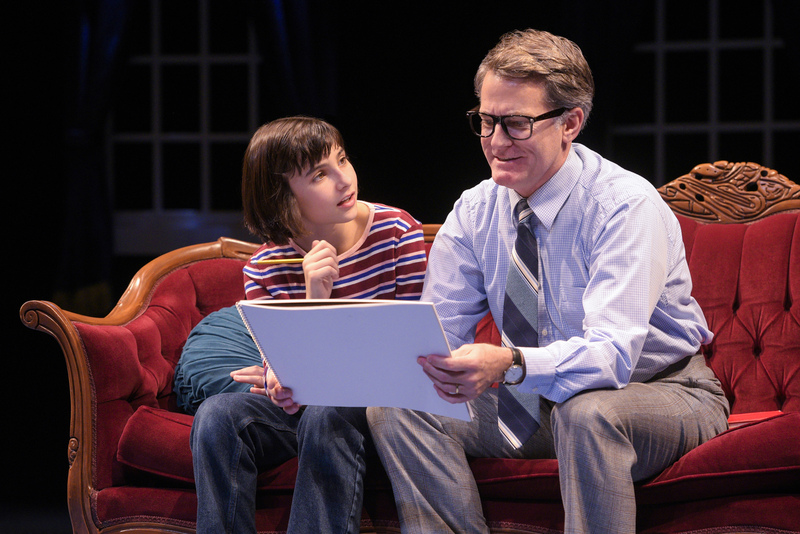 Small Alison (Lila Gold) receives advice on how to improve her school project from father Bruce (James Lloyd Reynolds) in “Fun Home,” presented by TheatreWorks Silicon Valley October 1-28 at the Mountain View Center for the Performing Arts. NOTE: Lila appears in performances on October 3, 5, 6, 7 (7pm), 9, 11, 12, 13 (8pm), 14 (2pm), 17, 19, 20 (8pm), 21 (2pm), 24 (7:30pm), 25 (2pm), 26, 27. 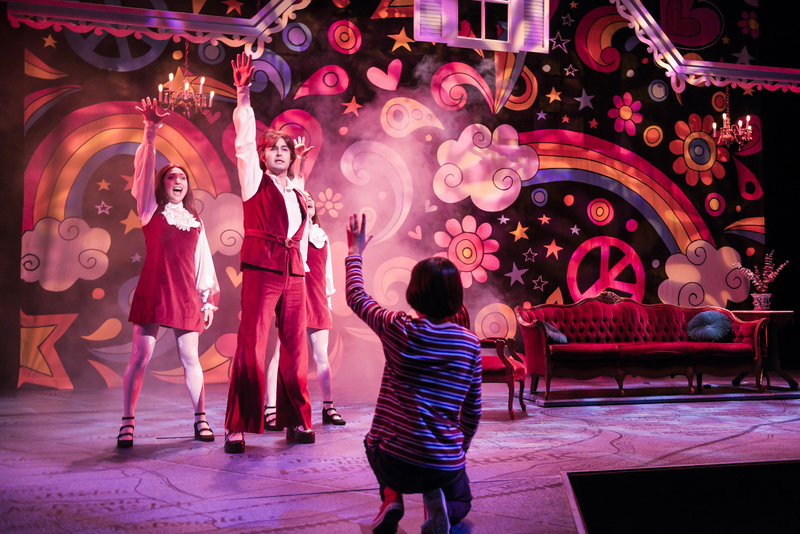 Small Alison (foreground: Lila Gold) fantasizes about her favorite TV show coming to life in her living room, complete with singers and dancers (l to r: Ayelet Firstenberg, Michael Doppe, Erin Kommor) in “Fun Home,” presented by TheatreWorks Silicon Valley October 1-28 at the Mountain View Center for the Performing Arts. NOTE: Lila appears in performances on October 3, 5, 6, 7 (7pm), 9, 11, 12, 13 (8pm), 14 (2pm), 17, 19, 20 (8pm), 21 (2pm), 24 (7:30pm), 25 (2pm), 26, 27. 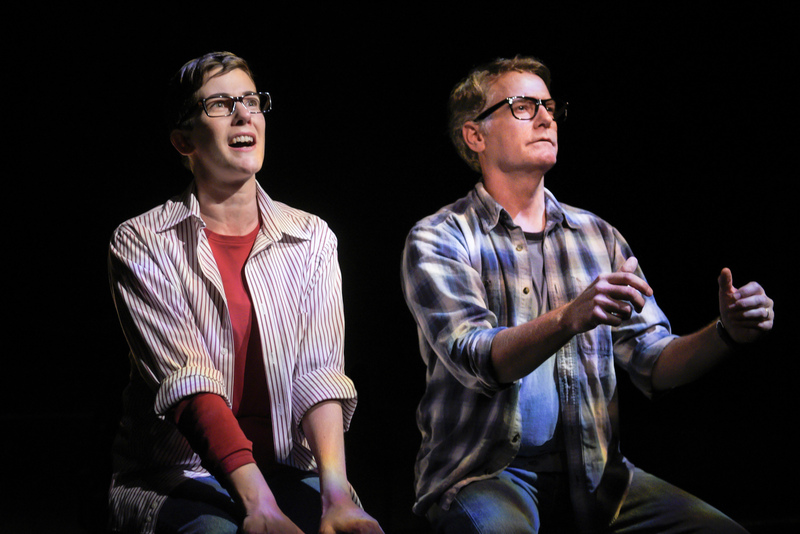 Alison (Moira Stone) remembers a car ride with her father Bruce (James Lloyd Reynolds) in “Fun Home,” presented by TheatreWorks Silicon Valley October 1-28 at the Mountain View Center for the Performing Arts. 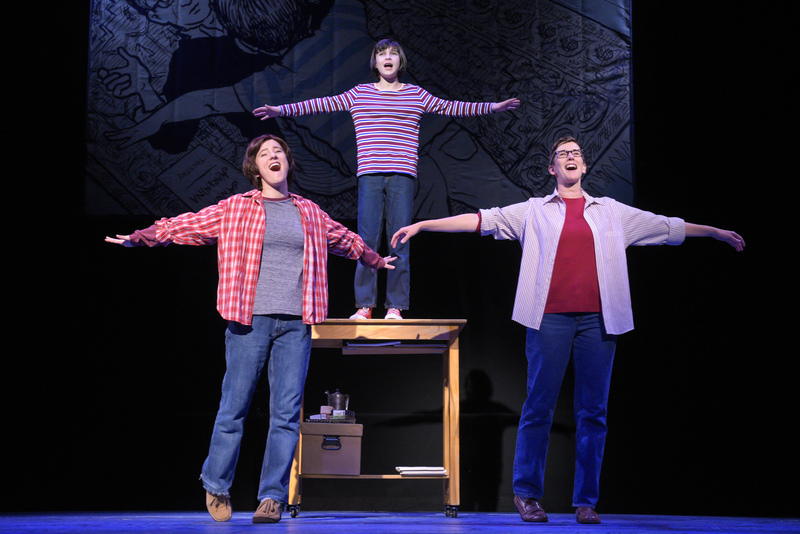 14: Medium Alison (Erin Kommor), Small Alison (Ruth Keith), and Alison (Moira Stone) remember playing airplane with their dad in “Fun Home,” presented by TheatreWorks Silicon Valley October 1-28 at the Mountain View Center for the Performing Arts. NOTE: Ruth appears in performances on October 2, 4, 7 (2pm), 10, 13 (2pm), 14 (7pm), 16, 18, 20 (2pm), 21 (7pm), 24 (2pm), 10/25 (8pm), 28 (2pm). 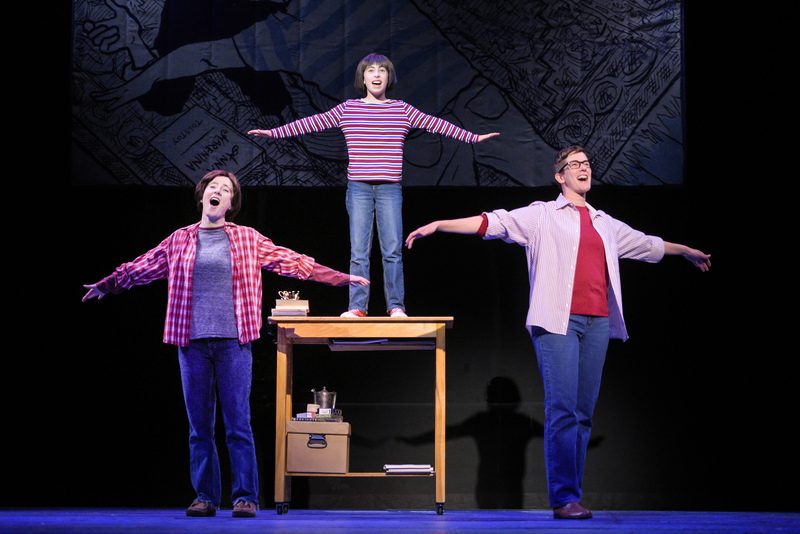 Medium Alison (Erin Kommor), Small Alison (Lila Gold), and Alison (Moira Stone) remember playing airplane with their dad in “Fun Home,” presented by TheatreWorks Silicon Valley October 1-28 at the Mountain View Center for the Performing Arts. NOTE: Lila appears in performances on October 3, 5, 6, 7 (7pm), 9, 11, 12, 13 (8pm), 14 (2pm), 17, 19, 20 (8pm), 21 (2pm), 24 (7:30pm), 25 (2pm), 26, 27. 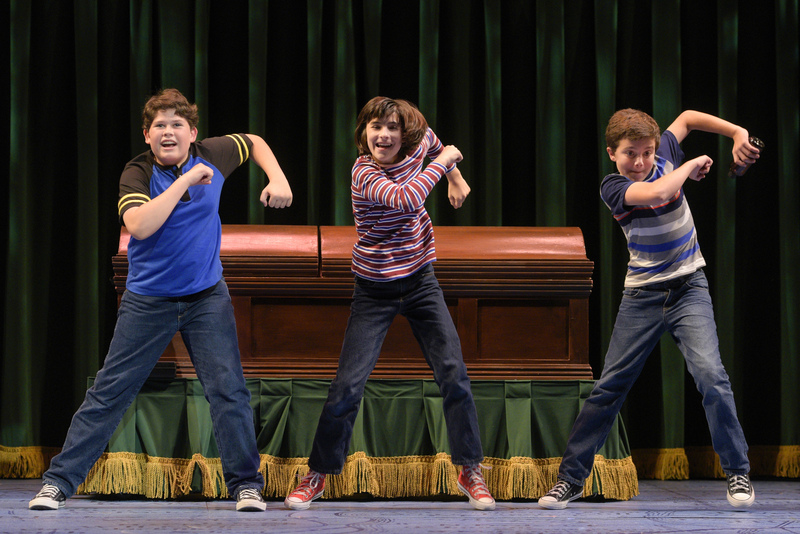 The Bechdel children (l to r: Dylan Kento Curtis, Oliver Copaken Yellin, and Ruth Keith) fantasize a commercial for their family-owned funeral home in “Fun Home,” presented by TheatreWorks Silicon Valley October 1-28 at the Mountain View Center for the Performing Arts. NOTE: These children appear in performances on October 2, 4, 7 (2pm), 10, 13 (2pm), 14 (7pm), 16, 18, 20 (2pm), 21 (7pm), 24 (2pm), 10/25 (8pm), 28 (2pm).